TEMPE, Ariz. (AP) — Sedrick Barefield scored 17 points and hit the tying 3-pointer with 1.8 seconds left in regulation, helping Utah knock off No. 21 Arizona State 80-77 in overtime Thursday night. Utah (13-7, 5-4 Pac-12) led 79-77 late in overtime and had a chance to stretch it, but David Collette missed two free throws with 20.9 seconds left. Arizona State (15-5, 3-5) missed two shots on the next possession and Barefield hit 1 of 2 free throws. The Sun Devils’ final shot, a running 3-pointer by Tra Holder at the buzzer, was nowhere close. Arizona State went up three on Shannon Evans’ layup with 9 seconds in regulation, but opted not to foul and Barefield knocked down a 3-pointer to send it to overtime tied 69-all. Barefield made all four of his 3-point attempts and the Utes went 14 of 32 from the arc to avenge an earlier loss to the Sun Devils. Holder led Arizona State with 23 points. Arizona State won the first meeting on Jan. 7 in Salt Lake City, grinding out an 80-77 victory despite committing 31 fouls and its top three frontcourt players fouling out. The Sun Devils’ issue in the first half of the rematch: Defense. After a good start , Arizona State repeatedly left shooters open on the perimeter and open lanes to the basket, allowing the Utes to build a 35-27 lead late in the half. Johnson had 13 points by halftime and Utah made 7 of its 15 attempts from the 3-point arcto lead 40-33. The Sun Devils tightened up defensively to open the second half, pulling within three after Utah missed eight of its first nine shots. The Utes continued to clank shots, but Arizona State had a hard time capitalizing as Utah pushed the lead back to eight. Martin brought the big-run Sun Devils back. He hit a pair of 3-pointers while scoring 10 straight points to put Arizona State up 57-55. Evans followed with a 3-pointer to make it a 13-0 run, but the Utes fought their way back. 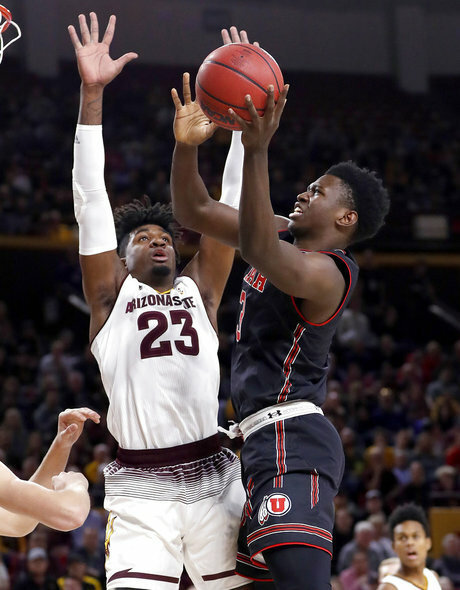 Utah was unable to close out its first game against Arizona State, but picked up a crucial win by making the plays down the stretch in the rematch. Arizona State is in danger of dropping out of the AP Top 25 after losing for the fifth time in eight games. Utah: At No. 11 Arizona Saturday. Arizona State: Hosts Colorado on Saturday.